Many people who want to lose weight through exercise often wonder what exercise burns the most fat. If you ask different weight loss experts, you will probably get different answers. Generally, there are three types of exercises that burn the most fat. These consist of cardio exercises, resistance training or strength training, and a combination of both. There is probably not one exercise that burns the most fat and most trainers will recommend doing a combination of cardio and resistance training exercises to get the best results. Here are some exercises that burn the most fat, but to increase your chance of success, you must do these regularly, combined with a healthy, balanced diet. Burpees consist of a full body exercise that can be done at home. This form of aerobic exercise is often used in strength training because it helps tone your core muscles, your upper body muscles as well as the legs at the same time. Doing burpees can help you burn approximately about 200 calories in 30 minutes. Jumping lunges are great for toning the thigh muscles. The momentum you use to jump in between the lunges can be a big calorie burner at about 459 calories per hour. 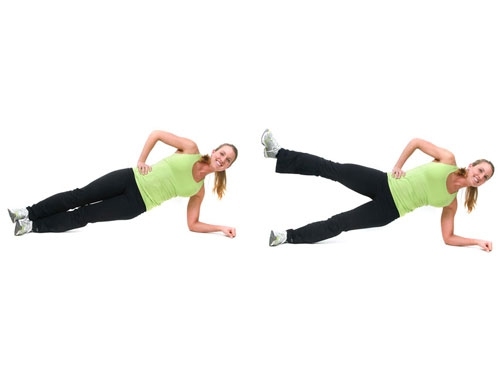 This exercise specifically targets the muscles of the outer thigh, the obliques, and the deltoids. It requires great strength as well as whole body coordination to accomplish. You can burn as much as 300 calories per hour with this move. This is a simple cardio exercise that anyone can do at home. It is an excellent way to increase your heart rate quickly. You can do these between sets of strength training to boost the number of calories you burn. You can burn up to 204 calories per hour with this all-time favorite exercise. These simple exercises use machines for accurate and better performance. Step Aerobics is one of the favorite cardio exercises of women. It mainly targets your hips, glutes, and legs. You can burn up to 400 calories in 30 minutes. Elliptical Trainer is another excellent cardio exercise that also helps improve your endurance. You will burn approximately 300 calories in 30 minutes. Spinning is a high-intensity workout that uses music to mimic a challenging bike ride using images of hills and valleys with varying speeds. A group instructor assists in the process. Spinning burns up to 612 calories per hour. Bicycling is another great cardio exercise that can be done indoors using a stationary bike or outdoors with a real bike. The amount of calories you burn may depend on the speed and resistance you use. This can vary between 250-500 calories within 30 minutes. Power yoga is a challenging workout consisting of vigorous, fitness-based approach to yoga. It involves the use of your entire body, and emphasizes on building strength. Power yoga can help you burn about 300 calories in one hour. Pilates is a unique system of exercise that is designed to improve core strength and increase flexibility. It also promotes total body balance as well as weight loss. On the average, doing one hour of Pilates (intermediate level) will help you burn about 380 calories. BodyPump classes combine cardio and strength training using barbells, complete with upbeat music. Classes are conducted by professional trainers and consist of rigorous workouts designed to raise your heart rate burn up to 600 calories in one hour, depending on the intensity of your workouts. Do not exercise when you are hungry. You are more likely to burn more calories if your body has been fed. Here's what to eat before and after a workout. Always begin with a warm up. Warm muscles burn more fat. Begin your workout early. This habit can increase your likelihood of exercising threefold. Increase intensity gradually. Do strength training exercises for 30 minutes at least three times a week to burn more fat. Once your body fat is under control, you can proceed with two weight training sessions per week to help you maintain muscle tone.